Facebook comments can now be edited | Happenings, Marketing and Technology Advice and Thoughts! It looks like when Facebook sneezes it becomes news. Amply proven by my posting this article as well. 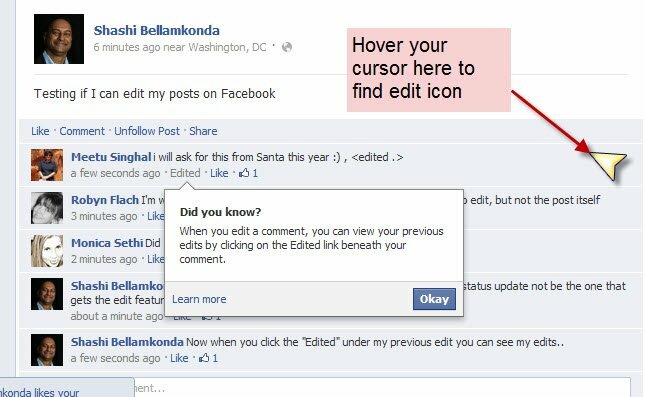 This evening Facebook introduced a feature that many users have been asking - the ability to edit their comments. Till today it was possible to edit your comment if you did that immediately after you posted your comment. Both TechCrunch and Mashable let their users know about the new feature. Meetu Singhal -Web and Social Media Strategist at 33voices posted the photograph accompanying the article to show users how to access the edit button. The most common reasons for using this feature is when you make a typo or add a clarification. Facebook did not have to do this but decided to allow anyone to see the edits after they are made by using the "Edited" link under the comment. Some users did not appreciate is that you can see the history of the edits if you clicked on the "Edited" link under a post that has been edited. We wish the feature had been extended to the Status Update as well which still cannot be edited but can easily be deleted. What do you think of Facebook's new edit feature for comments? Thanks. Great Tip. Now I can edit my typos and do not have to delete them. That is really impressive, I am really impressive in some new features of facebook.thanks for the share. You might wanna know about some of schroff enclosures for facebook commenting system. This might be of help.